Caron No. 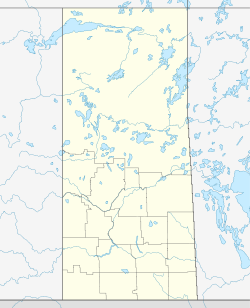 162, Saskatchewan is a rural municipality of 500 rural residents (2006 census) in the southwestern part of Saskatchewan, Canada. The RM was incorporated December 9, 1912. Other localities in the area include Abound, Archydal, Archydal Airport, Caron, Grayburn, and Grayburn Airport, McKeown Airport. Besant Park Campground and Recreation Area is along the Trans Canada Highway. The village of Caronport is enclaved in the R.M., just a little northeast of its centre, and is not technically part of Caron No. 162. The Burrowing Owl (Athene cunicularia), an endangered animal, makes its home in this area. As well, the Smooth Arid Goosefoot (Chenopodium subglabrum) and Long-billed Curlew (Numenius americanus) is of special concern in the ecoregion. ^ "Saskatchewan Conservation Data Centre - Conservation Database". Saskatchewan Conservation Data Centre. 2007. Retrieved 2007-12-26. ^ "Caron No. 162, Saskatchewan, Canada, North America". World Index. Rumbletum.org. 2004. Retrieved 2007-12-26.